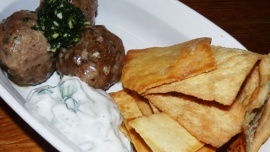 Decided to go towards the Mediterranean route and create a meatball that would be drizzled with tzatziki, a cilantro parsley sauce and served with a side of warm naan bread or on top of basmati rice. In this case, it was pita chips. Plain Greek yogurt, olive oil, lemon, dill, garlic, cucumber, salt, pepper. Meatball mix looking like a state.